Robin Mayes’ pre-match team talk inspired the squad to produce a co-ordinated team performance from the beginning of the game. This was against an Oxted team, who had a good contingent of younger skilful players in their squad of 11 rotational outfield players. LX performed well down the right side with excellent attacks initiated by the fast-running Peter RB Wilson at inside forward and Keith Hunt on the wing, who nearly scored after a determined run past several opposition defenders. At the other end of the pitch, Alan Dures demonstrated his experienced technical ability, coming out at least three times to repulse runs and shots, strongly supported by guest player Sean Lance at left back, and George Hazell playing in his usual dynamic and ball-winning role. Nigel Spencer-Knott at centre half had an excellent assertive game, with timely interceptions and accurate pass distribution, whilst Robin Mayes defended well and made strong runs down the right. At half-time the score stood at 0-0, which was very well deserved given that six of LX were over seventy and the remainder over sixty-five. At the start of the second half Moonshiners increased their pressure, but LX breakaway attacks down the left wing from Adrian Money, and the non-stop running of Peter Ross ensured the game was very balanced, with Tony Jones at centre forward, going close to scoring on several occasions following some excellent individual runs, given the close attention from the Oxted sweeper Neil Conquest. It was only in the 63rd and 68th minutes of the game that the result was decided because of tiring LX legs in defence, with Andy Duncan and Jonathan Trim scoring two decisive goals for Oxted, following the customary excellent skills of Steve Douty (Oxted). After the game both teams adjourned to the Oxted British Legion Club, where they were served an excellent meal prepared by the Steward and his wife (Beverley). 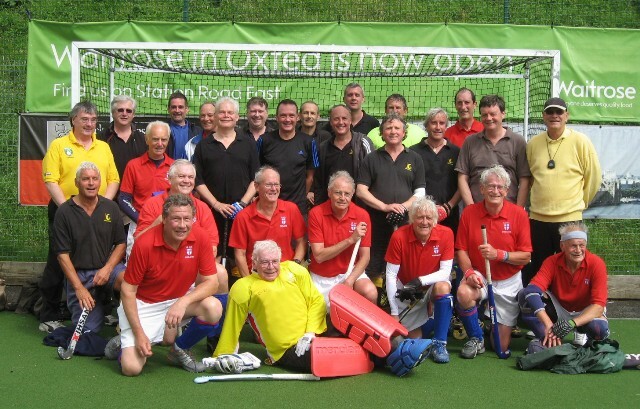 Robin Mayes (LX Club Manager) thanked Oxted for their usual high standard of hospitality, and especially Rainer Vogt for his organisation of the fixture, who along with James O’Hara superbly umpired the game. LX team: Alan Dures, George Hazell, Sean Lance (guest player), Robin Mayes (Captain and Match Manager), Nigel Spencer-Knott, David G. Read, Keith Hunt, Peter RB Wilson, Tony Jones, Peter Ross, Adrian Money.